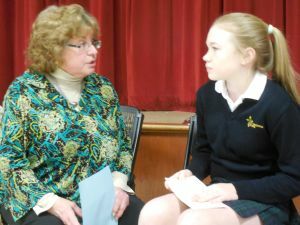 Anne Hileman (left), senior program officer and scholarship programs coordinator for the Connelly Foundation, chats with St. Christopher School student Emma Licsauer Dec. 8 as she was named a Neumann Scholar by the foundation. Emma Licsauer, an eighth grader at St. Christopher School in Northeast Philadelphia, was named a Neumann Scholar Monday, Dec. 8. She will receive full tuition from the Connelly Foundation, which granted the award, to an archdiocesan high school of her choice. Of the 1,300 students who applied for the scholarship, 897 eighth grade students from 123 archdiocesan elementary schools qualified to take the scholarship test. Licsauer was one of 35 students in the Archdiocese of Philadelphia who were awarded the scholarship. She is the 17th St. Christopher School recipient of a Neumann Scholarship since it was introduced by the Connelly Foundation in 1996.